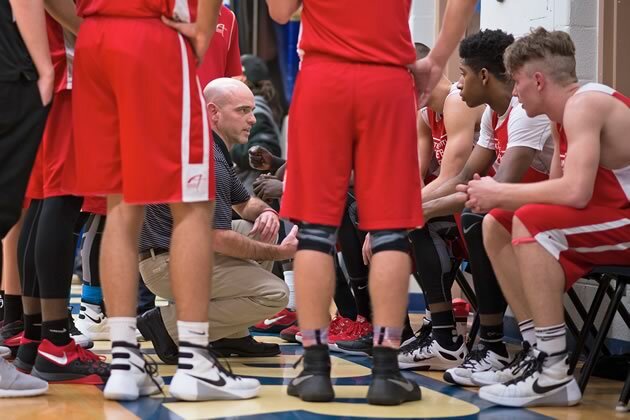 With the top high school basketball program in the country and the NBA taking notice, a local family has made Orangeville the new epicentre of Canadian basketball. On a warm evening in mid-November, the stands are packed in the Father Henry Carr gymnasium. It’s midway through the fourth quarter of a tight basketball game at this high school in the working-class Toronto neighbourhood of Rexdale. The kids in the stands are out, only in part, to see their own team, one of the best in Ontario for decades. The real attraction is Thon Maker, a seven-foot-one high school senior from Orangeville. Right now, he is Gulliver invading Lilliput. Foul. Foul. Foul. Basket. Basket. Basket. Father Henry Carr is draping their whole team on one player, but Thon is having his way with them. And while his height and skills close to the hoop have made him a National Basketball Association prospect, it’s what he does next that makes him a potential superstar. 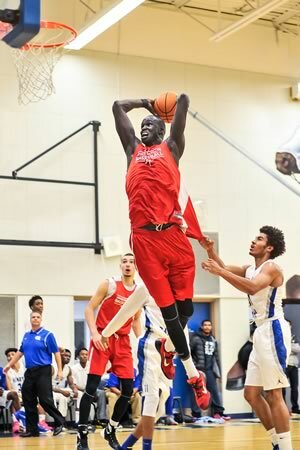 Thon Maker of Athlete Institute Prep is fouled while going up for a dunk against the Father Henry Carr basketball team in Etobicoke last fall. Photo by James MacDonald. Thon catches the ball 20 feet from the basket, and jabs one of his impossibly long legs forward to make his defender think he is about to gallop forward. Instead, Thon dribbles the ball, and quickly steps back behind the three point line. As he takes the shot, Thon’s off-balance defender lurches forward and knocks him on his rear. The crowd gasps, then lets out a loud “Aahhhh!” as the ball slides through the hoop. “We waited for the trap, we took it, we broke it down and blew it open at the end,” Thon says after his team, Athlete Institute Prep, turned the close game into a 95-63 shellacking. 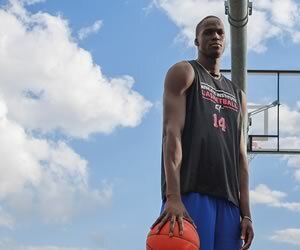 Thon’s success is a testament to his talent and hard work – with a major assist from the Athlete Institute Basketball Academy, which he has attended for the past two years. Its headquarters on Highway 9, east of the TSC store on the edge of Mono, look rather ordinary. But going on inside is what has become the top high school basketball program in Canada and one of the best in North America. Its talented players attend Orangeville District Secondary School and spend the rest of their time honing their hoop skills. Many will win scholarships to top American colleges, play in the prestigious National Collegiate Athletic Association (NCAA) – and have a shot at being drafted into the NBA. Until now, almost every recent top Canadian basketball star left home at a young age to go to an American prep school. As young as 13, they tend to lose touch with their country, often live thousands of miles from their parents, and are sometimes purposely sheltered from any semblance of a normal teenage existence. Now, the decades-long southward tide is turning, not only keeping Canadians here, but attracting non-Canadians north. Thon, for one (he was born in Sudan and is now an Australian citizen; see sidebar, page 27), made the shocking decision to actually leave an American prep school to come to Orangeville. He appears to be following in the footsteps of Kitchener native Jamal Murray, whose decision to “stay home” and play for the academy while attending ODSS from 2013 to 2015 served the University of Kentucky basketball star well: He’s projected to be joining the NBA this spring. 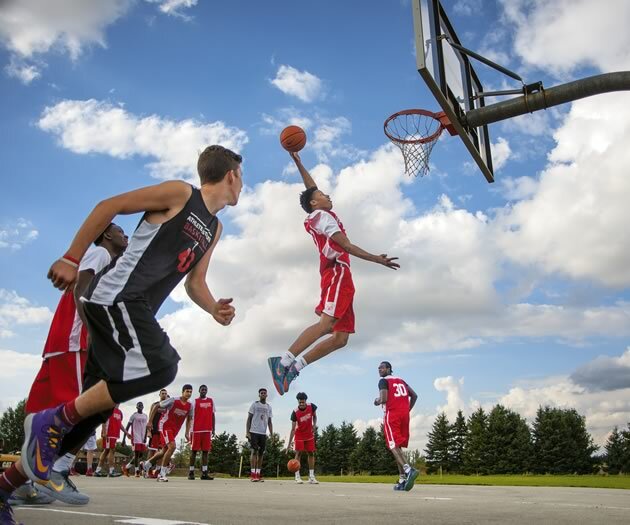 Thanks to a local family’s entrepreneurial drive and belief in this community, the future of Canadian basketball – perhaps even the NBA – now courses through Orangeville. Brandon Lesovsky coaches guard Tyrell Leotaud as Athlete Institute Prep starts to take over the game against Father Henry Carr. Photo by James MacDonald. 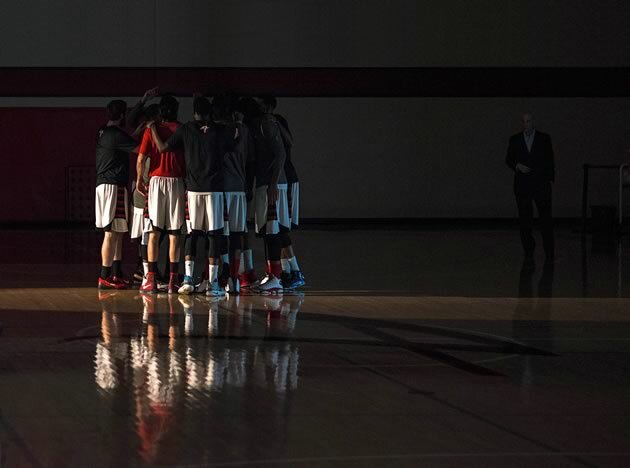 The program comprises two fairly equal teams – Athlete Institute Prep and Orangeville Prep. AI Prep is the better of the two, thanks to Thon’s outsized abilities. They compete in a new elite basketball league, the Ontario Scholastic Basketball Association (see sidebar, page 31), largely against top schools like Father Henry Carr, and in tournaments against the best teams in the United States. A small private bus is constantly moving the players between ODSS, the academy and the residence, and to games all over Ontario and the U.S., though they take the regular school bus to Orangeville in the morning. There are no bush parties or hanging out at the mall. “Naw, our guys are dedicated,” Thon says after the game. For pretty much everyone in the program there is one aim. “Our whole goal is to get kids scholarships [to U.S. universities],” says Tony McIntyre, director of basketball operations for both teams. Playing exceptional basketball in front of the right American coaches is just the first step to getting one of those all-expenses-paid tickets to a top post-secondary institution. They’re going nowhere without good grades. And this year the kids’ grades are the highest since the program started in 2010. While the players, ages 14 to 19, have little time for anything outside of school, practice, athletic testing, working out, games, travel and sleep, they enjoy top-notch perks. Everything at their disposal is among the best in North America. The academy’s gym floor is sprung like an NBA court, a brand new residence is under construction on the property, top basketball minds like Brandon Lesovsky and Tony McIntyre are on tap, they eat meals from local caterers Lavender Blue, and receive cutting edge training that builds both strength and long-term health – in other words, everything a professional sports team would have. In fact, now there is an actual professional team on site from whom the prep teams can learn the highs and lows of pursuing a hoop dream. Last year, the Tippings moved the minor league pro team they own, the Brampton A’s, into town, renaming it the Orangeville A’s. Athlete Institute president Jesse Tipping on the court where he grew up, as the high school players practise. Photo by James MacDonald. Both Jamal and Thon are projected to be top 10 picks in the NBA draft over the next two years, guaranteeing them at least $10-million in salary out of the gate. Career earnings of more than $100-million could be in the offing. With these success stories in mind, kids are now pouring in literally from coast to coast – Newfoundland to Haida Gwaii – and abroad to join local players from Mono, Beeton and the GTA. If all this national and international renown seems implausible for a small rural community in the shadow of the GTA, then you should get to know Jesse Tipping and his belief that Orangeville is the perfect place achieve an improbable dream. Orangeville A’s power forward Justin Moss goes up for a shot in the game against the London Lightning, while his teammate, power forward Flenard Whitfield, jostles for the rebound. Photo by James MacDonald. It’s the first game of a gruelling stretch of 17 games in 48 days for the AI Prep squad. Jesse is sitting on a balcony next to his office, overlooking the Athlete Institute court. “Orangeville is on fire for basketball,” he says, as AI Prep starts to pound the visiting Bill Crothers Secondary School team from Markham. Jesse was a gifted athlete and a basketball nut. He bopped around from school to school trying to get the right mix of academic benefits and basketball competition, but feels he never really found it. Playing for ODSS and then two Ontario private schools in the early 2000s, there was “no exposure” to the U.S. colleges he dreamed of playing for. He played for Brock and Waterloo in university, but for him the experience only served to illustrate how our college sports system pales next to the U.S. In an exhibition game in 2006, he played against the University of Florida just after their Gators, stacked with future NBA superstars, had won their first of two NCAA championships. If only he had gone to a big U.S. prep school, would he have had a chance to play on a team like that? 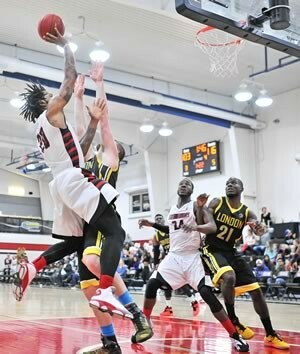 The professional Orangeville A’s play home games at the Athlete Institute court through to the end of April. The institute is located on Highway 9, east of Orangeville. For ticket and schedule information, visit asbasketball.ca. 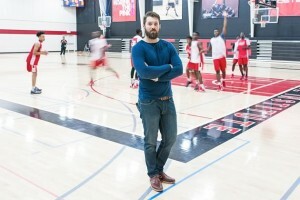 Jesse took over management of the facility from his father in 2010, building on what was already an elite sports club to establish a high school basketball mecca. It was far from a slam dunk. “Everybody said, ‘You can’t do it, it’s not possible to have the best players stay here in Canada,’” he says over the sound of squeaking sneakers as AI Prep brings home a 96-54 win. 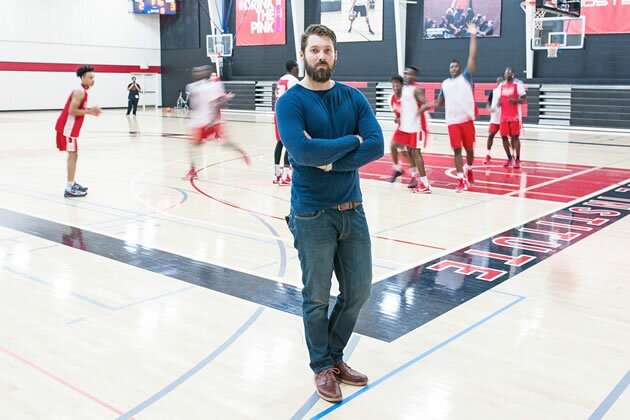 On top of the foundation of a strong academic program and a pro-level facility and staff, Jesse and his management team built relationships with top Canadian prospects and basketball coaches across the country. After Jamal signed on and thrived, and Thon dumped his U.S. prep school to venture north, Jesse’s dream is rapidly being realized. Along the way, he’s found out that small-town Orangeville has a lot more to offer an entrepreneur than its giant suburban neighbours. 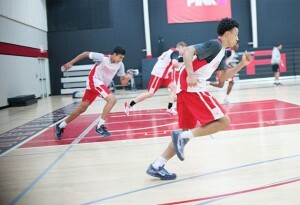 Jaelin Llewellyn of Orangeville Prep runs through after-school drills with his fellow students. Photo by James MacDonald. Winter has caught up with us and the parking lot outside the field house is frozen, dark and packed. It’s the opening game for Orangeville’s first professional basketball team, the A’s of the National Basketball League of Canada (NBLC). Inside, the stands are mostly full and the crowd is getting pumped up for some high-level hoops. It is a family event with little kids dressed in PJs so they can slide from the minivan into bed at the end of the night. It’s a family affair for the Tippings too. Jesse is walking the crowd and James is watching from one of the balcony boxes. But they’re the least-involved Tippings. Jesse’s siblings are actually in the game. Younger brother Jameson is in the starting lineup and sister Jacki is on the bench as the A’s basketball operations manager and assistant coach. As the opening lineups are announced, the lights go low for the hometown introductions. The announcer has a booming professional voice and a highlight video plays on a big screen. It’s not quite a Toronto Raptors game, but it’s a lot closer, a lot cheaper, and still a lot of fun. It also seems like a big gamble on a small town. The NBLC is only a few years old and already struggling in some much bigger markets. Tonight, the home squad is playing Windsor, a city that has eight times the population of Orangeville. Other teams in the division, London and Niagara, hail from regions that are also much larger. And the Tippings actually moved this team from sprawling Brampton which is 20 times the size of its new hometown. Despite the population downgrade, Jesse is hoping for a small bump from the 450 average attendance at Brampton’s relatively cavernous Powerade Centre. “Four hundred and fifty people in a venue that holds 4,000 doesn’t look awesome. Five hundred in a venue that seats 750 looks pretty good,” he jokes. On opening night, on a date that most adults mark for hangover-nursing, the crowd is looking pretty close to Jesse’s hoped-for number. He laments that while “as great as it is that it’s diverse,” Brampton’s fragmented media scene and lack of a real core made it almost impossible to reach its sprawling population and get them excited about a sports team. 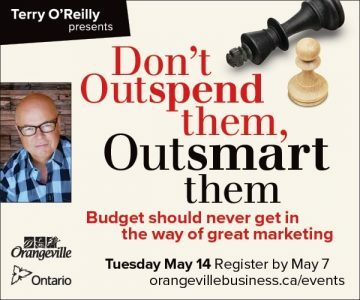 “We can do one [marketing] thing in Orangeville and have almost 90 per cent of the community know what’s going on,” he says. 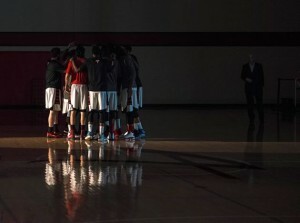 Professional players from the Orangeville A’s huddle before the tip off of a home game against the London Lightning on January 16. Photo by James MacDonald. This is basketball’s holiest temple. A shrine to both the sport itself and the first Canadian who went to the U.S. for basketball (he just didn’t know it when he crossed the border). Dr. James Naismith of Almonte, Ontario invented the game here 125 years ago and he is still the most revered figure in the sport’s pantheon. It’s the weekend of the Hoophall Classic and the two Orangeville teams are interlopers in what is otherwise an elite, all-American affair. Athlete Institute Prep is matched up against Nevada behemoth Findlay Prep (the high school choice of almost every Canadian currently playing in the NBA) in the main event, broadcast across North America on ESPN and TSN. Findlay has figured out that neutralizing Thon is the best way to stop AI. While Thon and others shoot some stunning three-pointers, they lose the game 73-59. Orangeville Prep’s opponent is even mightier. Florida’s Monteverde Prep has won the U.S. national high school championship an astounding three years in a row. Mississauga’s Jaelin Llewellyn – just six-foot-two, rail thin, 16 years old and quick as a whip – makes a series of killer shots. Orangeville is almost able to overtake the Monteverde powerhouse in the final minute, but falls a few points short. In this setting, however, players don’t have to win games to win praise. A top U.S. scout tweets how impressed he is with the way Jaelin “plays older than his years.” A day later it’s announced that Jaelin has been offered a full scholarship from a top college program, Wake Forest University in North Carolina. Two other big schools, Creighton University in Nebraska and Providence College in Rhode Island, make overtures based on what they saw in Springfield. Teammate Kalif Young and others also get a wave of offers. Dr. Naismith would have been proud. So is a family from Orangeville who took a chance that a small town could seize the ultimate home court advantage. The Academy from Mick Partlett on Vimeo. 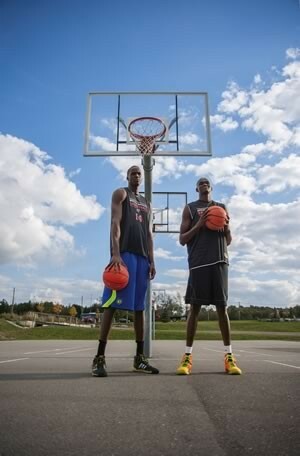 Brothers Thon and Matur Maker at the Athlete Institute Basketball Academy near Orangeville. Thon is considered a lock to play in the NBA and his younger brother may soon follow. Photo by James MacDonald. With a series of remarks on Twitter, Thon Maker blew a seven-foot-wide hole in the idea that U.S. high school basketball programs have no equal. In September 2014, the top prospect wrote, “I’m tired of playing with no shot clock. Against sorry competition. And with non passing guards!” And with that he announced he was leaving his school in Virginia to come to Orangeville to play for the Athlete Institute Basketball Academy. The online gasps were almost audible. It was called “the most important move in Canadian high school basketball history” by hoopshype.ca, while others sneered, “What is he thinking?” and “What a joke.” No one is scoffing now. Thon knew this program would drive him to add new skills to his floor game and muscle to his skinny frame. “Those two really came together when I came to Orangeville,” he says, noting the exceptional quality of the Athlete Institute’s facilities, staff and teammates. Thon and his younger brother – Matur, 18, also a top college prospect with a shot at the NBA – escaped war-torn South Sudan when they were small boys. When Thon was 14, the two were discovered by Ed Smith, an American-Australian who was helping young African athletes find educational opportunities. Ed took over guardianship of the Maker boys and the three have been joined at the hip and on the move ever since. After stops in Uganda, Australia and Virginia, the Makers now live in Orangeville with Ed (who is also an assistant coach with the academy). This is the first year select high school teams have been playing in a new elite league called the Ontario Scholastic Basketball Association. The Ontario Federation of School Athletic Associations still runs a broader program of tournaments across the province. The league, which includes seven teams from six schools (two from Orangeville), was created and is owned by the Tipping family’s company Pretty River Sports and Entertainment. This year the league was dominated by the two Athlete Institute Basketball Academy teams. The league plans to expand to include girls’ teams in the 2016-2017 season. Grant Ellis is 6' 3", yet has never dunked a basketball. The general manager of Business News Network, he lives in Caledon and Mono. 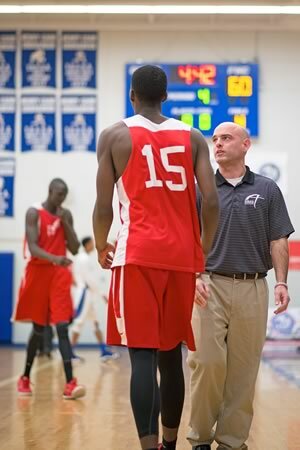 Dispelling some myths around Athlete Institute’s latest NBA draft prospect Thon Maker.